BACKGROUND: No pharmacokinetic data exist for premature infants receiving single-dose nevirapine (sd NVP) for prevention of mother-to-child transmission (MTCT) of HIV. Aim. To describe NVP decay pharmacokinetics in two groups of premature infants - those whose mothers either received or did not receive NVP during labour. METHODS: Infants less than 37 weeks' gestation were prospectively enrolled. Mothers received sd NVP during labour if time allowed. Infants received sd NVP and zidovudine. Blood was collected on specified days after birth and NVP concentrations were determined by liquid chromatography-mass spectrometry. RESULTS: Data were obtained from 81 infants, 58 born to mothers who received sd NVP during labour (group I) and 23 to mothers who did not receive NVP (group II). Of the infants 29.6% were small for gestational age (SGA). Median (range) maximum concentration (Cmax), time to reach maximum concentration (Tmax), area under the plasma concentration-time curve (AUC) and halflife (T½) were 1 438 (350 - 3 832) ng/ml, 25h50 (9h40 - 83h45), 174 134 (22 308 - 546 408) ng×h/ml and 59.0 (15.4 - 532.6) hours for group I and 1 535 (635 - 4 218) ng/ml, 17h35 (7h40 - 29h), 168 576 (20 268 - 476 712) ng×h/ml and 69.0 (22.12 - 172.3) hours for group II. For group II, the median (range) volume of distribution (Vd) and body clearance (Cl) were 1 702.6 (623.7 - 6 189.8) ml and 34.9 (6.2 - 163.8) ml/h. The AUC was higher (p=0.006) and Cl lower (p<0.0001) in SGA infants. Plasma concentrations exceeding 100 ng/ml were achieved over 8 days in 78% infants in group I and 70.0% in group II. The MTCT rate was 4.8%. CONCLUSION: Women in preterm labour often deliver with little advance warning. Our study suggests that NVP dosing of preterm infants as soon as possible after birth without maternal intrapartum dosing may be as effective as combined maternal and infant dosing. 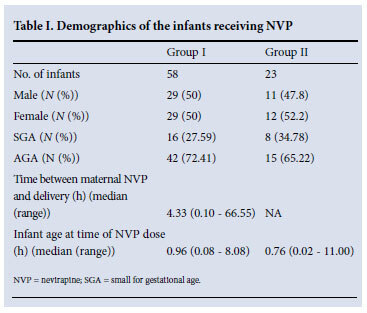 Our aim was to describe NVP decay pharmacokinetics in two groups of premature infants: those whose mothers either received or did not receive NVP during labour. The study was conducted in the Neonatology Department at Tygerberg Children's Hospital from February 2005 to April 2009. Premature infants whose mothers were admitted during labour were eligible. Infant growth was classified as small (SGA), appropriate (AGA) or large for gestational age (LGA) using the Fenton chart.13 All infants were fed with either formula milk or pasteurised expressed breastmilk. Inclusion criteria. Infants born to HIV-infected women before 37 weeks' gestation were eligible. The new Ballard score14 was primarily used to determine gestational age, and when it was not available, data from abdominal ultrasound scans or the date of the last menstrual period were used. Maternal HIV infection status was determined according to South African Department of Health programme guidelines, which are based on guidance from the World Health Organization.15 HIV-1 antibodies were detected by a rapid test and positive results were confirmed on a second assay from a different manufacturer. Informed consent was obtained from the women enrolled and, when available, from the fathers. Exclusion criteria. Infants were excluded if their mothers were on long-term NVP or other antiretrovirals, or receiving any drug known to interfere with NVP absorption, metabolism and distribution; on request by the mother; or if the infant's haematocrit was below 30%. If the haematocrit fell below 24% during the study, blood sampling was deferred until the haematocrit was higher than 24%. Mothers received 200 mg NVP during labour if time allowed. All babies received sd NVP as soon as possible after birth. The infant NVP dose was 6 mg if birth weight (BW) was above 2 000 g and 2 mg/kg if it was below 2 000 g. Infants also received zidovudine (AZT) for 7 days, 12 mg twice daily if the BW was above 2 000 g and 4 mg/kg twice daily if it was below 2 000 g. Infant blood samples (0.2 ml) were collected on days 1, 2, 4, 6, 8, 14 and 21 after birth. After sampling, blood was immediately centrifuged and the plasma was separated from the centrifugate and stored in a -80ºC deep freeze until the assays were performed. Plasma concentrations of NVP were determined by liquid chromatography-mass spectrometry using a Waters Alliance 2690 HPLC coupled to a Waters/Micromass ZMD single quadrapole mass spectrometer.16 The mobile phase consisted of 50% acetonitrile in 4 mM ammonium acetate, 0.1% trifluoroacetic acid. A 20×2.1 mm Hypersil Gold C18 column (Thermo) was used at a flow rate of 0.3 ml/min. Neostigmine served as internal standard. Detection in positive ionisation mode of nevirapine was at 276.2 (m/z) and neostigmine at 223.2 (m/z). To precipitate protein, 50 µl of acetonitrile containing 1 µg/ml internal standard was added to 20 µl of each sample or control. Samples were vortexed for 30 seconds, and centrifuged for 5 minutes at 750 g. After this 2 µl of the supernatant was injected onto the column. The standard curve was linear to 0.1 µg/ml. The lower limit of quantification (LLQ) was set at 100 ng/ml. Quality control samples of 0.8, 3 and 9 µg/ml were included with each run. Inter- and intra-day percentage coefficients of variation were less than 10% for all controls. An HIV-DNA-PCR test was done 28 days after birth. After determining NVP plasma concentrations, the plasma concentration-time profile for each patient was plotted using GraphPad Prism 4 (GraphPad Software Inc., USA). NVP pharmacokinetic parameters were calculated using a non-compartmental analysis. The maximum concentration (Cmax) and time to reach the maximum concentration (Tmax) were obtained directly from the plasma concentration-time profile. The area under the plasma concentrationtime curve from zero to 21 days (AUC0-504) was calculated by the trapezoidal method. The AUC from zero to infinity (AUC0-∞) was calculated using the following formula: AUC0-504 + Cplast/ Ke, where Cplast is the last measurable plasma concentration. The following formula was used to determine the volume of distribution: Vd = dose/ (AUC0-∞ × Ke). The total body clearance (Cltot) was calculated using the following formula: Cltot = dose/AUC0-∞. The elimination rate constant (Ke) was calculated as the slope of terminal log-linear phase of the plasma concentration-time profile multiplied by -2.303. The half-life (T½) was calculated using the formula: T½ = 0.639/Ke. Patient data were organised and coded onto data collection forms and captured into Microsoft Excel spreadsheets. NVP concentrations and pharmacokinetic parameters were analysed using descriptive statistics. 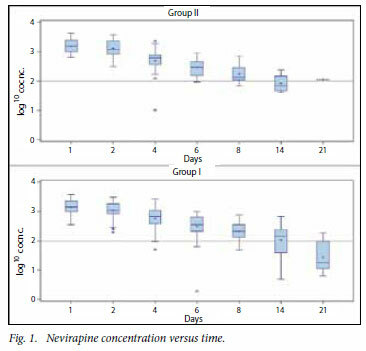 The proportion of infants with NVP plasma levels >100 ng/ ml on day 8 in groups 1 and 2 were compared using the chi-square test with the null hypothesis that the proportions for the two groups were equal. The statistical software used was SAS version 9.2 (SAS Institute Inc., Cary, NC, USA). The study was approved the ethics committees of the universities of the Western Cape (Reference Nb 04/7/10) and Stellenbosch (Reference Nb 04/10/183). Of 100 mothers, 68 received NVP during labour. Of their infants, 2 were withdrawn before enough blood samples could be collected, 1 died before the study was completed, and the volume of blood collected was insufficient for 7. Of the 32 infants whose mothers did not receive NVP, 2 were withdrawn, 1 died, and the volume of blood collected was insufficient for 6. Gestational age was determined with the new Ballard score in 59 cases (72.8%) and antenatal ultrasonography in 19 (23.5%). Table I sets out the demographic data for the 81 evaluable infants. The median gestational age was 34 weeks (range 28 - 37 weeks) and the median birth weight 2 052 g (range 950 - 3 400 g) for group I and 36 (28 - 37) weeks and 2 100 (1 028 - 3 460) g for group II. Twentyfour (29.6%) of the infants were SGA. Sixty-three received formula milk and 18 pasteurised expressed breastmilk. NVP plasma concentrations are presented in Table II and as box plots in Fig. 1. In the box plots the mean is denoted by +. The lower, middle and upper edges of the box represent the first quartile, the median and the third quartile, respectively. Extreme values are denoted by *. At 8 days after birth, 78% of infants whose mothers had received NVP had a NVP plasma concentration above 100 ng/ml compared with 70% of infants whose mothers had not received NVP (p=0.49). The median (range) Cmax, Tmax, AUC and T½ were 1 438.00 (350 -3 832) ng/ml, 25h50 (9h40 - 83h45), 174 134 (22 308 - 546 408) ng×h/ml and 59.00 (15.40 - 532.60) hours, respectively, for group I and 1 535 (635 - 4 218) ng/ml, 17h35 (7h40 - 29h), 168 576 (20 268 -476 712) ng×h/ml and 69.00 (22.12 -172.26) hours for group II. The median (range) Vd and Cl were 1 702.56 (623.74 - 6 189.77) ml and 34.91 (6.20 - 163.79) ml/h in group II (they could not be calculated in group I). The AUC was significantly higher and Cl significantly lower in SGA than AGA infants (Wilcoxon rank sum test p=0.006 and p<0.0001, respectively). Four infants (3 from group I and 1 from group II) were infected (transmission rate 4.8%) (95% confidence interval 1.3 - 11.9%). Our study was the first to look at NVP elimination in both SGA and AGA preterm infants. The NVP AUC was significantly higher and Cl significantly lower in the SGA infants. We postulate that placental insufficiency could impair the levels of activity and maturation of CYP enzyme systems. Our data support an NVP dosage of 2 mg/kg for infants born before 37 weeks' gestation. In term infants whose mothers do not receive intrapartum NVP, we recommend giving two doses of NVP, one immediately after birth and a second 48 - 72 hours later. Our data suggest that this may not be necessary in premature infants. Acknowledgement. The South African Medical Research Council (MRC) supported the study. We thank the mothers and babies who participated, personnel from the labour ward, Department of Neonatology and Children's Infectious Diseases Clinical Research Unit (especially Sr B Hill, T Wahl and Mr G Fourie), Dr J L van Zyl of the High-Risk Neurodevelopmental Follow-up Clinic, Tygerberg Children's Hospital, and colleagues from the Pharmacokinetic Laboratory at UCT and the School of Pharmacy at UWC.